Traveling to the UK soon? It’s easy to feel right at home in Britain, where it’s easy to navigate the place, find hotel bookings, cheap recreational activities, and great sights waiting to be discovered. North Americans share a bit of common heritage with Britain. During the height of its empire, Britain ruled about a quarter of the world and they successfully passed on some of their cultures to their colonies. It’s one of the main reason people love going to England and the rest of UK. The official and proper name of UK is The United Kingdom of Great Britain and Northern Ireland. 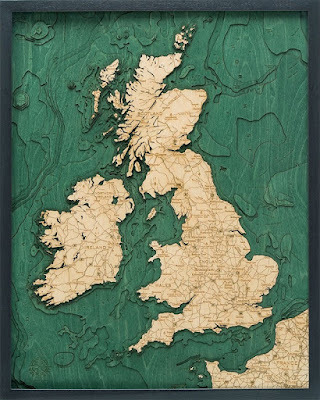 Great Britain comprises of three other countries, England, Scotland, and Wales which are all different from one another. It’s not like a state or county, these countries have their own local government, unique ethnic identities, and own rich culture. Nothing annoys people from Scotland or Wales than being called English. If you call someone English who’s definitely from Ireland, you might find yourself in big trouble. It’s always generally safe to ask. The Royals especially the Queen are the biggest attractions in Britain. But don’t assume everyone loves them. Britain may seem small on the map compared to the US, but don’t forget their number is huge. An estimated 60 million people live in the UK and at least 8 million live in Greater London. Asking if they know the Queen is a ridiculous and laughable matter to start a conversation – it will never happen. The harsh reality is Brits don’t pay much attention to the Royals or to the Queen. It’s not like what you see on the TV. She may appear on the news from time to time, but that’s just it. And it’s a bit entertaining for some, but don’t expect everyone will be jolly good when it comes talking about the Queen. Britain and the rest of the UK are busy people, and well aware of the time. You’ll find them racing up or down the escalator in airports, stores, train station, or the ‘Tube’. For them, walking gets them to their destination faster and more efficient. If you don’t feel like going with the flow, then stand on the right side of the escalator and let the busy traffic past on the left. For them, standing on the left is a social crime, and you’ll hear a lot of grumble by standing on it. Likewise, they love to fall in line that’s why they call it a queue. Jumping in front of the line will also get you in trouble. Don’t let them label you as ignorant and rude tourists in doing so. Brits either love or hate their daily commute with the ‘Tube’ or their subway systems, depending on the time of the day. But their ‘Tube’ is the most extensive and efficient public transport systems in the world. That being said, it’s the most popular way of getting around the city; it gets overcrowded, very stuffy and hot. So anything that impedes the locals in getting that dreaded morning commute is having tourists blocking their way. Whatever you do, don’t jump in front of the carriage when there are people lining up to get onboard. This makes it easier for people getting off and boarding the train. It prevents overcrowding when another door remains virtually empty. Make sure of the map, sometimes walking above and on the streets are far better than navigating the labyrinth-like underground systems of Britain. You could easily get annoyed when you already accumulated a pocket full of coins. But whatever you do, don’t throw them out. Don’t underestimate the value of British coin. Spend them on your daily adventure; they are not just useless coins clanking around in your purse. A single British pound coin is worth at least a dollar and a half. Two-pound coins are worth more than two dollars. So a pocket full of them can buy you a decent snack may be more. 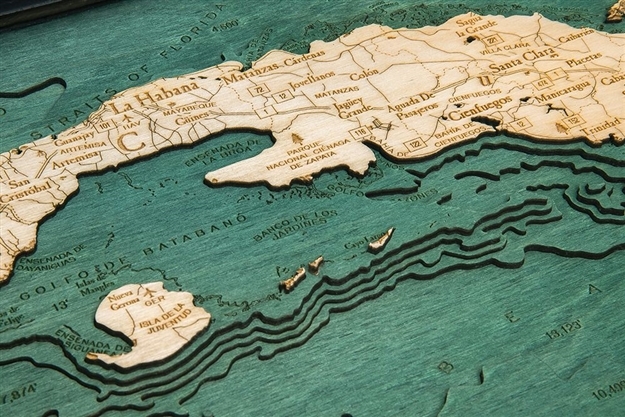 https://www.carvedlakeart.com/cuba-wood-nautical-chart-map-p/cuba-d4m.htm Check out carvedlakeart if you want the best deals on lake art, wooden map, laser cut map in Cuba, and charts of the lakes, streams and oceans of the world. There are so many places and things to do when visiting Cuba. One can easily fall prey to its many tourist's traps, losing many travelers to its labyrinth of attractions. But whatever your itinerary is, here are some of the important monuments and places to visit in Cuba. Founded in 1913 and 1920, this very iconic museum used to be a Presidential Palace. It used to house some of the controversial and well-known Cuban Presidents. Museo de la Revolución is a great architectural beauty on its own. Designed to resemble Tiffany's of New York and the Palace of Versailles, many are attracted to its architectural design and historic exhibits. On its grand central staircase, a bust of Jose Marti will greet visitors with bullets holes sustained during a failed attack on the palace in March 1957. The attack was an unsuccessful attempt at assassinating the former President Fulgencio Batista. There are other interesting exhibits in the museum like the SAU-100 tank used by Castro during Bay of Pigs battle in 1961, a replica of the 18m yacht that carried Fidel Castro from Mexico to Cuba in December 1956. Other exhibits include vehicles, planes, and rockets associated with different uprising during the course of its political turmoil. Many would come to Malecón to witness the most sought-after view of the beautiful crimson sunset, the most dramatic of all in Cuba. Its 7 km-long sea drive, Malecón is a popular meeting place for all people – traveling minstrels, poets, painters, young couples, and fishers. Just overlooking boundaries of the US state of Florida, it’s a laid out oceanside boulevard for Havana’s middle-class people in the early 1900s. Malecón has its own unique vibe and electric architectural design both indicating of neoclassicism mixed with whimsical art nouveau. As a very popular destination for the pleasure-seeking middle-class in Cuba, it expands into a very busy six-lane highway that attracts many vintage cars like Buicks and Chevrolets. Today, Malecón is known as “the world’s longest sofa”, where people come to meet new friends, debate over their political views, and sometimes just to enjoy the full view of a beautiful sunset. Sitting atop of 60 meters high at the front of Santiago harbor and about 10 km southwest of the city, Castillo de San Pedro de la Roca del Morro has been listed as a Unesco World Heritage Site since 1997. It was initially designed by the famous Italian military engineer Juan Bautista Antonelli in 1587. Antonelli was the same engineer who built La Punta and El Morro in Havana. The fort aims to protect Santiago from pirates who ransacked the city in 1554. But the work didn’t start until 1633 because of financial constraints, 17 years after Antonelli died. Today, the fort houses Museo de Piratería and exhibits from the US-Spanish naval battle that took place in 1898. Tourists who climbed the fort are treated with an amazing view of Santiago’s coastline under the majestic shadows of Sierra Maestra. Every day at sunset, tourists can witness the cañonazo ceremony or firing of the cannon at the Fort where guards dress up in Mambises regalia. Dubbed as the finest art gallery in the whole of Caribbean region, art lovers are recommended to pay a visit to the Museo Nacional de Bellas Artes. Its entire collection expands over two campuses where 'Arte Cubano' building displays the most comprehensive Cuban art collection in the world. The other part, 'Arte Universal' is designed to overlook Parque Central, with views as amazing as the art it holds within. The museum houses purely Cuban art which display its collection in chronological order starting on its 3rd floor. Tourists can view the artworks of the famous Cuban artists like Guillermo Collazo, the first great Cuban artists, Raul Martinez, the master of Cuban pop art, Rafael Blanco and his cartoon-like paintings, and Wifredo Lam, with his Picasso-style paintings. Step back in time to see some of the well preserved baroque architecture. Dating from the 1700s, Plaza de la Catedral is one of the most uniform baroque style buildings. The area was originally a swamp but later drained to be used as a naval dockyard. The plaza is known as the grandest mansions ever built in Cuba and houses the Museo del Arte Colonial (Colonial Art Museum). Its popular tourist's destination wherein visitors can stroll its cobbled streets which are lined with many restaurants and cafes. One of the most visited sites in Cuba, Plaza Vieja is one place encompasses the true Cuban spirit. It’s one exotic place where music is played in almost every corner, and people enjoying twisting their hips as they go by their famous dance –salsa. Initially called as Plaza Nueva or New Square, its main purposes were to be used for military exercises which were laid out back in 1559. However, it was far from its intended purpose, Plaza Vieja now sits on a busy marketplace teeming with restaurants, cafes, and breweries. At nightfall, the place is buzzing with many touristy activities, and different kinds of music filled the air. 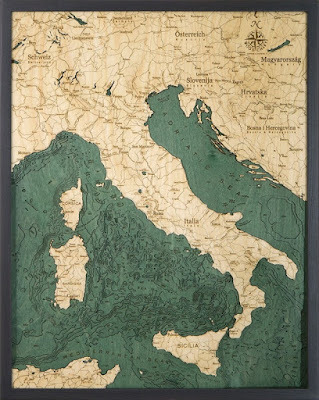 http://www.carvedlakeart.com/virgin-islands-wood-nautical-chart-map-p/virg-d3n.htm Check out carvedlakeart if you want the best deals on lake art, wooden map, laser cut map in Virgin Islands, and charts of the lakes, streams and oceans of the world. Formed about thousands, if not millions of years ago, the Virgin Islands sits between the Atlantic Ocean and the Caribbean Sea. It’s a group of islands separated from the Renaissance Islands by the Anegada nearby the main island of Puerto Rico. The Virgin Islands have three main parts; United States Virgin Islands, British Virgin Islands, and Spanish (or Puerto Rican) Virgin Islands. It’s a common fact that the Virgin Islands is a popular destination for travelers around the world. From the high-end shopping districts, go back in time as you tour Fort Christiansvaern or the Estate Whim Plantation Museum to the nature lover’s abode of Virgin Islands National Park in St. John. Here are other popular destinations along the Virgin Islands. The most convenient way to experience nature at its finest is to tour Virgin Islands National Park in St. John. If you are already in St. John, you are probably standing right on the edge of the protected forested area. Two-thirds of the island is a deeply forested area and boasts one of the most scenic views in the area. Caneel Bay, Trunk Bay, and Annaberg Plantation are just a few minutes away from each other. The best part in St. John is it offers different ways to enjoy this paradise. Travelers who want to have a bit of adrenaline rush can go hiking on its 22 trails. For a more family-friendly activity, one can experience sleeping under the stars in its camping camp right on the beach. The beaches along the Virgin Islands are known to be the best in the world, and nothing is can surpass the beauty of Magens Bay at St. Thomas. The northern coast of the island is the most popular and most photograph beach in the world. A quick drive on top of the mountain, travelers can view a beautiful heart shaped beach. But nothing can compare to the view which is like paradise on earth; glassy clear water and powdery white sand will greet the travelers. Because of the popularity of the beach and great reviews on the various website, be prepared to pay a higher price to experience a piece of this paradise. To avoid crowds, visit the beach in the early morning or later in the evening. But for some people, the most idyllic of all beaches are in Trunk Bay. The beach has the most beautiful pearly white sand and turquoise water. Because its part if the Virgin Islands National Park, Trunk Bay maintained its untouched glory of paradise. Its serenity and scenic view are incomparable among the other beaches in the world. The best time to swim in its waters is during the early morning as they are few people walking the beach. You can enjoy a half day of undisturbed snorkeling. Try to follow the beautiful Underwater Trail, a snorkeling path to see the hidden underwater treasures of Trunk Bay. The beach is a perfect spot even for beginner snorkelers. Even though the prestigious Caneel Bay Resort is just nearby, Caneel Bay is free for all travelers who want to enjoy this pristine beach. Most travelers would recommend taking advantage of this freebie. The best way to reach the beach is to hike or bike about 1.5 miles going to Cruz Bay, which is a short distance from the beach. But arriving via a boat is the easiest way to go in Caneel Bay. Another option to enjoy the beach is to go for a swim in its crystal clear waters and have a luxurious meal in one of the hotel’s restaurant. To have a more private swim, venture into the Honeymoon Beach but getting there might be a challenge; you need to swim about 0.3 miles from Caneel coast. The Estate Whim Plantation Museum shows the early life of the Cruzans during the 18th century particularly their sugar cane production. Tour the Frederiksted museum; venture into the windmill and bath house. Another private residence serves as a great family destination; the Estate Mount Washington Plantation was once a sugar cane plantation that offers tours within its vicinity. There are many lessons to learn to go to this place like the island's sugar cane production and the lives of Cruzan slaves. One of the most powerful nations of the ancient times and the fascinating country today, Italy helped shaped the modern day European continent. There are hundreds of different ways to know more about the country and each one of them will surely leave a mark in your hearts. Italy has a lot of historical sites still standing today; it’s amazing to think these are the same monuments which the greatest early thinkers built for their nation without any modern technology and machinery to help them. Would it be spectacular to these some of the most important monuments up close in their most preserved form? Luckily, here are some of them which everyone in the family can enjoy when visiting ‘The Boot’ or some may say the land of great history and diversity. When thinking about Rome, the first thing comes to mind to most travelers is The Colosseum. No surprises there, The Colosseum signifies the grandeur of the Roman Empire. It’s the largest amphitheater ever built by the Romans. Built in the 70 AD and with Greek architecture design it used to host gladiator battles, mock sea games, and animal hunts. It’s a direct contrast to the modern day buildings that surround it. Once the center of the Roman Empire, it was surrounded by different government buildings and a very busy marketplace. Built like a rectangular plaza, its ruins make for one of the most significant monuments in Italy. During the peak of the empire, The Roman Forum was the center of all important government decisions and negotiations, its historical significance is very much incomparable. The Pantheon is hailed as the best-preserved monument of the ancient Roman Empire. Romans built constructed this place to be used as a temple dedicated to the pagans gods of Rome. What makes this monument so spectacular was its marvelous elegant design and precise architectural proportions despite the absence of modern day technology. Beams of light entering the top of the dome would reflect throughout the Pantheon, its strategic placing of windows still amazes experts to this day. Milan Cathedral is the third largest worldwide. It took a good long six hundred years to complete the infrastructure. The result? It’s one of the most spectacular and majestic buildings in Northern Italy. It’s associated to the Magisterium of the Bishops based on gothic architecture. The sight of the building will leave you breathless in awe. Those six centuries of patiently building and meticulously planning the cathedral really paid off. What does not destroy you, strengthens you, or in this case, makes you famous. The Leaning Tower of Pisa became a world sensation for its very obvious flaw. Construction began in the 1100s and started to lean towards ground due to weak foundations. Experts predicted that the tower will completely topple over by the year 2000 but Mother Nature decided not to. Every year, thousands of visitors climbed its steps to get the very scenic view of the whole city. During the ancient Roman times, Pompeii was a booming city and an important port in the Mediterranean free trades. But the devastating eruption of Mount Vesuvius stopped the city on its track from becoming one of the most influential port cities in the world. Under the shadows of the volcano, stand the ruins of the once great city. Today, Pompeii is a modern-day tourist attraction in Italy, where visitors can have a glimpse of the ancient civilization. The ruins of Pompeii are now a UNESCO world heritage site. Visitors can explore the desolate remains of baths, temples, and other artifacts of the city. After the fall of the Roman Empire, the Pope gradually took over Rome. It was built in memory of the first Pope, St. Peter, it was now a very important destination for Christians all over the world. The Vatican is the center of the Catholic Church, Head of the Roman Catholic Church and serves as a home to the Pope. It houses some of the world’s priceless pieces of art which makes it even more significant. The dome was painted by none other Michelangelo himself that alone is worth a visit to the Vatican. Not to mention, the flamboyant Swiss guards that manage to control the visitors in the vicinity. The St Peter’s Basilica attracts millions of devotees and visitors alike all year round. 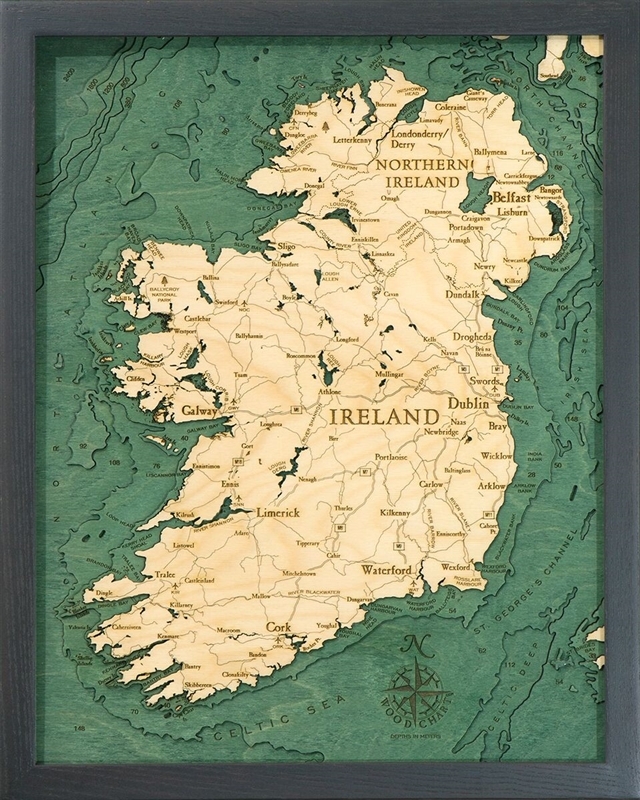 The name “Emerald Isle” really suits Ireland because of its vast mountains filled with abundant evergreen. Hailed by many as the most beautiful place on earth, travelers are often left in awe with its lush forest, picturesque cliffs, and dramatic beaches with crystal clear waters. Ireland houses some of the most magnificent castles and small adorable towns on earth. Here are some of the amazing places in Ireland worth visiting. https://www.carvedlakeart.com/Ireland-wood-nautical-chart-map-p/irel-d3s.htm Check out carvedlakeart if you want the best deals on laser cut map, wood nautical chart in Ireland, wood topographical map, and charts of the lakes, streams and oceans of the world. Most people would start their Irish adventure in the Ring of Kerry, hence its popularity. It’s the most scenic of all Irish trails that really worth exploring. This 120-mile route traverses the southwestern part of Ireland with spectacular views of lush meadows, glacial lakes, medieval castles, waterfalls, and vertigo-inducing coastal scenery topped with turquoise beaches. Called the Ring of Kerry because the trail starts and ends in Killarney, a very popular and historic inland town located at the oldest protected wilderness in Ireland – the Killarney National Park. Almost all tourists look out for the country’s only herd of wild red deer and take their most memorable photo-op in a 15th-century castle. The Cliffs of Moher are one of the most iconic places in Ireland; Slieve League is the home of the highest sea cliffs in the region. Located at the northwest coast in Donegal, it’s about a good 2,000 feet drop from the very top to the Atlantic Ocean below. Many falls in love with the views where many could see picturesque Donegal Bay and the Ben Bulben Mountains in Leitrim overshadowed by the clear blue sea and the mindless songs of seabirds. Some say one can find the most beautiful treasure in the farthest corner of the earth. Nothing in the world can perfectly describe such phenomena than the Dingle Peninsula. Situated in Europe’s westernmost point, it’s a place where the ocean dominates the surrounding cliffs. The Dingle Peninsula has many magnificent ring forts and other ancient ruins. It’s a great contrast in the Ring of Kerry but offers the great same post worthy scenery of bright blue waters that surrounded by emerald green hills and golden sandy beaches. Mountain ranges adorned the mystic skyline where the Slieve Mish range to Mount Brandon, Ireland’s second highest peak can be seen. The Valentia Island is another great destination not far from the Ring of Kerry. For travelers who really want to explore the island, this place offers rewarding side trip. The island is located not from the Iveragh Peninsula and to the mainland by the Portmagee Bridge and features great natural beauty. Although its cliffs remain barren at most times, many marvels at its magnificent views of the coastline and a wide range of flowers and vegetation. Known as the Garden of Eden of Ireland, Beara Peninsula has the perfect subtropical climate that houses many species of plants, natural gardens, and basking seals in most of its secluded sandy beaches. Resting between Kenmare Bay to the north and Bantry Bay to the south, it’s almost magical to see the area’s picturesque and country back charm. It’s considered as a great off the beaten destination with great seaside views and colorful towns. Of all places in Ireland, travelers spent most of the time exploring the Killarney National Park. People go here to witness the most magnificent waterfalls in the country, the Torc Waterfall. This towering 60 feet waterfall plunge down via a river called the Devil’s Punch Bowl. The 41-square mile protected park is home to Ireland’s native red deer which been lived in the country since the last ice age. The native red deer take refuge in McGillycuddy’s Reeks, the tallest mountain range in Ireland. Great scenic lakes scattered all around the park which travelers seek out for. Another great attraction in the park is the old Irish Chieftain stronghold which dates back to the Middle Ages - Ross Castle. Constructed in the 15th century, this castle rests on the shores of Killarney’s lower lake. For travelers who love to see the beautiful structures of the past, Glendalough is the perfect place to start exploring these ruins. Known as the “City of Seven Churches”, this city has 6th-century monastic structural buildings. Set within the “Valley of Two Lakes” at the very heart of Wicklow Mountains, the glacial valley is renowned for hiking and walking trails. The most popular destination in the area is the 30-km Pilgrim Path through very scenic Wicklow hills known as St. Kevin’s Way. Medieval churches, stone crosses, and a cathedral highlight the green horizon. Just a few hours away from Ireland’s city center, Boyne Valley has the most beautiful green landscapes which were often disturbed by the monastic ruins and passage tombs. It's home to Trim Castle in which popularized by the famous Hollywood film “Braveheart”. One can find the most preserved passage of grain in all of Western Europe called Newgrange. It the oldest renowned pre-historic place which surpassed Stonehenge and the Great Pyramid of Giza dating back as far as 3000 BC. Another great place to see in Boyne Valley is the Hill of Tara, the former house of the High Kings of Ireland. Connemara has everything that true blood nature lover is looking for, many hailed as the place as the most unspoiled destination in continental Europe. It stretches from the west coast of the country, teeming with colorful wilderness. Connemara has one of the diverse scenery in Ireland from murky bogs, picturesque lakes to golden beaches and mystic mountain views. Incredible scenic views include the Twelve Bens Mountain Range, Connemara National Park, and the adorable towns of Clifden and Clifden Castle. https://www.carvedlakeart.com/united-kingdom-wood-nautical-chart-map-p/ukil-d4l.htm Check out carvedlakeart if you want the best deals on laser cut map, wood nautical chart in United Kingdom, wood topographical map, and charts of the lakes, streams and oceans of the world. At the top of the seven most memorable cities in Scotland is the Isle of Sky, also simply known as Skye. Known for its rugged landscapes, picturesque fishing villages, as well as medieval castles, the island of Skye is indeed a good place for visitors to start their journey in Scotland. On the shores of Loch Scavaig, a beautiful village can be found with a range of rocky mountains, known as the Cuillin mountain range. With the mountain range dubbed as the finest in Britain, visitors can enjoy a scenic view from the meticulously crafted footpaths of Cuilllin, which leads to dramatic peaks and cirques. If the arduous climb on the mountain range was not enough, visitors can also enjoy a hike on The Quiraing between Staffin and Uig--photographers would enjoy the spectacular landscapes of Scotland as they pass through this hill. In addition to this, visitors are also welcome to take a dip in the clear, seemingly vibrant blue and green, waters of the Glen Brittle Fairy Pools at the foot of the Black Cuillins. The well-known capital of Scotland is another one of the top seven memorable cities to visit in Scotland. With this ancient city having a medieval Old Town and elegant Georgian New Town with gardens and neoclassical buildings, visiting this hilly capital is a must. It has a collection of beautiful villages that are picture-worthy, as well as an incredible selection of world-class attractions, hotels, shops, eating, drinking, and nightlife--perfect for tourists coming from different parts of the world. Visitors who are interested in learning about history can visit the National Museum of Scotland with no cost and can visit the Edinburgh Castle for no cost. To those who are into spooky things, going on a tour in the Edinburgh Darkside Walk. It’s a place where you can learn about murders, mysteries, and legends, as well as Underground Ghost tours, are also available. Visitors who are planning a tour of the West Highlands of Scotland, Fort William and Glencoe are perfect villages to visit. Fort William is a substantial community that is full of salt water; a wide range of accommodation and activities to do in and around the town with cycleway, railways, and bus routes can be found in this village. Glencoe, a steep-sided high-valley village is famously known for its waterfalls and trails that climb peaks. Glencoe is dubbed as “one of the most dramatic, haunting places in Scotland.” Loved by hikers and climbers, Fort William and Glencoe has “mountains and a history of clan warfare. It is a broad highland meadow in the heart of Glen Coe, scene of the infamous massacre of MacDonalds by Campbell soldiers in 1692. Most visitors are happy to drive through the glen, stopping to marvel at three massive, brooding buttresses on one side and a towering, knife-edge ridge on the other. Many would venture to take a more challenging footpath up to the lost valley to seek out the historic hiding place of stolen cattle. This path is not for the light-hearted as its wilderness has been stained with the plotted murder of clansmen. With the extra time, Jacobite Steam Train from Fort William to Mallaig is also worth boarding on. The route is said to be one of the most picturesque rail routes in the world; it includes a crossing of the Glenfinnan Viaduct, which was featured in the famous Harry Potter films. Situated on Europe’s Atlantic edge, the Isles of the Outer Hebrides has 15 inhabited islands with their own unique way of life, and can easily be one of Scotland’s most fascinating destinations. In this isolated environment, visitors can enjoy peace and tranquility as well as the warm hospitality of its communities. Visitors are also able to enjoy a selection of museums and monuments as well as the Gaelic culture where crofting, community events, and ceilidhs bring people together. In addition to all of this, The Outer Hebrides also offer a range of wildlife animals that flourish in their unique environment; a nature-filled environment also comes with many opportunities for outdoor activities such as walking, cycling, canoeing, kayaking, kitesurfing, and windsurfing. On the west coast of Harris, Luskentyre can be found situated within its parish. Luskentyre has been dubbed one of UK’s best beaches according to the TripAdvisor Traveller’s Choice Awards, and its title is understandable due to its ethereal blur of swirling sands and shimmering blue streaks. Scarista is another beach that often attracts surfers due to its big Atlantic swells. Visitors can visit North Uist try Traigh Lingeigh and Traigh Hornais for great sea views, as well as Hosta Beach for surfing. Lastly on the Outer Hebrides in Barra, Traigh Eais an exhilarating one-mile stretch of sand can be found, the only beach in the world that doubles as an airport are found in Traigh Mhor, and a great spot for sunsets, with fine sand and deep blue seas can be found in Tangasdale Beach. To the south-east of the Outer Hebrides, the Inner Hebrides is found with 79 islands, in which 35 is inhabited, has many of Scotland’s fascinating destinations. Iona, a small island in the Inner Hebrides--surrounded by the remains of 60 Scottish, Irish, and Norwegian kings--, has its Abbey which is a perfect quiet place for peace and reflection. The island of Islay is known for its whiskey and numerous distilleries. Its tranquil beauty, sweeping vistas, and more than 20 beaches are also what makes up this wonderful island. The neighboring island of Islay, Jura, is amongst the wildest and most rugged places in Britain. With barely 200 people residing along its only road, Jura has stags on the hills, otters by the shore, and golden eagles in the crags. Last but not the least of The Outer Hebrides islands is Mull. Mull offers imposing mountain scenery and is known for its brightly painted waterfront houses and a beach of golden sand and clear waters in the towns of Tobermory and Calgary. Glasgow, a port city on the River Slide in Scotland’s western lowlands and Scotland’s biggest city, is known for its Victorian and nouveau architecture. Glasgow has plenty of world-class museums and galleries, breathtaking architecture, parks, unique attractions, high-street, designer retailers, and a range of bars, restaurants, and pubs. The place is making a comeback with its shipping, industry and commerce activities that reach far and wide around the world. Today it reinvented itself as a cultural hotspot in Europe filled with music, creative arts, design, theatre and much anticipated innovative cuisine. Scotland’s national park, the Cairngorms National Park, includes castles, distilleries, family attractions, as well as outdoor fun. The Cairngorms National Park was voted one of the top 20 places to visit in the world by the National Geographic Traveller Magazine. Many would recommend taking a long leisure walk around Loch Muick or cycling the Speyside Way. Visitors may find themselves in awe of the view 1,309 meters on top of Ben Macdui. For skiers, it is good to hear that skiing is possible in winter in the Cairngorms National Park. The history of Wales began thousands of years ago when Neanderthals first step foot in the country. Homo sapiens arrived in Cymru or Wales about 31,000 BC and the recorded modern human dates from the last ice age era about 9000 BC. Experts consider Wales as one of the significant countries for its ancient discovery of civilizations which dates back from the Mesolithic, Neolithic, and Bronze Age. But like of all Britain, the Celtic Britons and the Brittonic language dominated the country of Wales. In 43 AD the Romans began their aggressive conquest of Britain, they started their invasion in northeast Wales against the Deceangli. But it’s not until the 79 AD when they regained total control of Wales with their victory against the Ordovices. The Romans retreat from Britain in the 5th century gave way to the Anglo-Saxon invasion in Wales. The largest of these groups, the Welsh people stood as the foundation of the Wales countryside. Today, Wales is increasingly becoming popular as UK’s most favorite and most beautiful outback destination. Despite its size, it packed with a lot of fun outdoor activities that every family would enjoy. http://www.carvedlakeart.com/Default.aspCheck out carvedlakeart if you want the best deals on laser cut map, wood nautical chart ,wood topographical map, and charts of the lakes, streams and oceans of the world. Almost every country has its own railway systems, but the country’s very own railway system is something you wouldn’t miss when visiting the country. Known for its charming green valleys and majestic mountains, the Welsh Highland Railway system is home to some of the oldest and most scenic railways in the entire planet. Many travelers who had been on the trains, claims that it’s the most spectacular ride they had. The journey starts from the Porthmadog station and ending in Blaenau Ffestiniog. It will take travelers to the most beautiful route that runs through the narrow gauge and making its way at the very heart of Snowdonia National Park. It’s hop-on-hop-off, ride so travelers can freely disembark at any of the trailheads, and enjoy a short walk to really enjoy the journey. The Gower Peninsula remains as a very popular destination for Beach lovers and everyone who loves the sea. But the waters of the peninsula attracts most surfers even beginner surfers who want to experience the waves in the region. The area has lots of bays that has swell of waves forming at varying degrees. There are a number of surf communities that offers surf lessons for everyone who wants to be on the water. For adrenaline junkies, the peninsula features vertigo-inducing sea cliffs, rock arches, and hidden coves waiting to be discovered. But for travelers who just want to chill and enjoy the scenery, there are plenty of kayaking and coasteering spots all around the Gower Peninsula. There really no denying that Wales has one of the most spectacular views on the planet. Dubbed as the most beautiful view in all of UK, the Welsh coast offers an abundance of lush green valleys and majestic cliffs. The 870-mile walk links all the seaside tracks together in Wales, starting from Chepstow in the southeastern region to Queensferry in the North Wales Borderlands. The highlights of the tour are seeing the grand Pembrokeshire coast which looks like a giant chiseled it out from the Atlantic Ocean and the Llŷn Peninsula with views that teeming with wildlife and wild vistas. To celebrate the beauty of the Wales Coast, there are many walking festivals happening each year. Organizers have set a variety of walks to suit every traveler need like experiencing the authentic Welsh cuisine and craft ales. Snowdonia clearly represents the entire Wales scenery, beautiful mountain ranges with lush forestry. Located at the county of Gwynedd, Snowdonia boats of 14 majestic peaks standing at over 3,000 feet high and peeking through the clouds. The most famous of the peaks is perhaps the 3,546-foot Snowdon in which travelers can ride a train to see more of its spectacular view. Snowdonia can be seen as far on the West Coast in the county of Porthmadog. Because of its beauty, the place inspires some of the known legends in the world like King Arthur, who locals insist was Welsh. Another known fact about Wales is that the regions are teeming with historical castles – where history and myth co-exist, paving the way for many fairy tales like stories of the modern world. Wales houses more than 600 castles with dozens of them in well-preserved conditions. Some of the most famous castles include Harlech, Conwy, Criccieth and of course Caernarfon. Caernarfon Castle was the most extravagant and expensive castles ever built by a king of England.